This tool is part of Ultimate Suite. With this collection of 60+ professional tools, you can accomplish any task. Working with time-related values requires a deep understanding of the way the DATE, DATEDIF, and TIME functions work in Excel. This add-in lets you quickly perform date and time calculations and get ready-to-use formulas without much effort. Below you can find a detailed description of how to work with the tool. Note. If you have a value in the selected cell, it will be replaced with the resulting formula. If you already have a formula there, the result will be added to it. Select or enter the start date - the day you want to subtract from or add to date and time units. Also, you can get a cell reference inserted into the field using the Select range icon. Tip. You can even use cells with standard Excel NOW and TODAY functions to start with. Note. Keep the field blank to add the necessary time units to the existing formula. However, if you leave the field blank while your destination cell is empty, the add-in will take the earliest date used in Excel as the base for calculations: 1/0/1900. 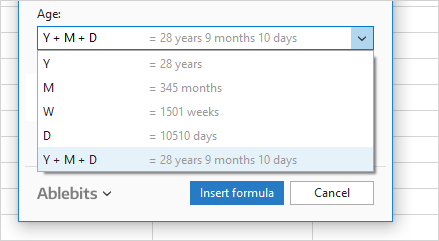 To add or subtract years, months, weeks, or days, click in the corresponding field and use the Select range icon that appears there. Also, you can enter the number manually. Feel free to use all fields at once or fill in just one of them. Tip. Use a cell with a date for any field, and the add-in will automatically fill in all units available in the specified value. Please note that this will work only if the CELL function returns one of the date formats for it. Click in the field of interest and use the Select range icon to pick the cell with the necessary value in your Excel worksheet. Or feel free to enter the number manually. You can use all fields at once if needed. The Formula result area helps you see the selected date or time calculation right away. It will also show #Value errors if any of the fields refer to data in non-numeric format, e.g. text. Tip. You can copy the details of the result by right-clicking the preview field. Tip. The formulas you build will be imported into the add-in for the next time you start it. Say, you create a formula and close the Wizard, but then realize that you need to fix that formula. If you select a cell with the formula and run the add-in, you will see that all the initial arguments remain in the corresponding fields. You do not need to enter them again, just change the wrong values keeping the right ones intact. Pick the dates to find the difference between. You can click in the field and then pick the cell with the date in your Excel table or type in a date manually. Click the Expand arrow icon to open a calendar and select a date from there. Use the Select range icon to point to a cell in your worksheet. Tip. Use =NOW or =TODAY functions in one of the fields and get a formula that will keep comparing a date to the current one. If you want to omit years in your calculations and show the difference in months and days only, choose to Exclude years. 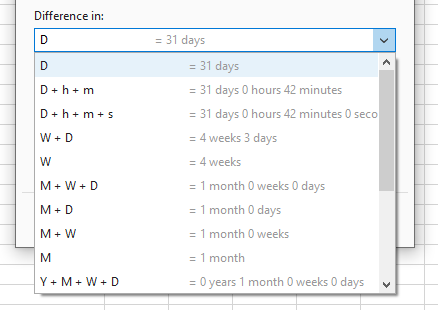 To see the difference in days and skip the month count, tick off the Exclude months box. Say, you are trying to compare "1/1/2015" and "3/1/2017". If you choose to show the difference in months, you will get "26 months". If you pick "Y+M" for the result, you will see "2 years 2 months". To get the difference in months without years, tick off Exclude years and you will get "2 months". Check the Add text labels option to see the description of the numbers in the result. For example, "5 weeks 3 days". When the label option is not selected, you will see numbers separated by your system delimiters, e.g. "5/3". If the date difference result may have zero values, e.g. "1 week 0 days", you can hide them by selecting the checkbox Do not show zero units and get "1 week" instead. The DATEDIF function in Excel will return an error if date 1 is greater than date 2. Our tool ignores the order of dates by default but you can use the option to show Negative result if Date 1>Date2. 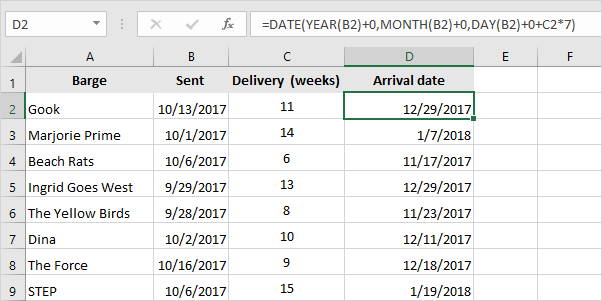 Here is an example: you are trying to see the number of days between two dates in Excel, 1/15/2018 and 12/29/2017. 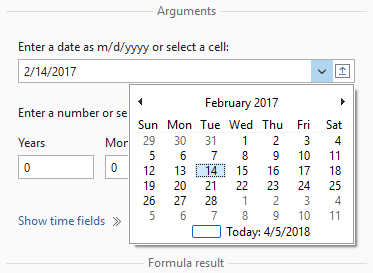 Select this option to get "-17 days" if 1/15/2018 is selected as Date 1. Without this option checked, you will get the plain difference of "17 days" no matter what date you select first. Note. You will see a preview of the formula in the destination cell. Click Insert formula to see the result in Excel and use it for further calculations. Specify the Date of birth: select a cell that contains it or enter the date manually. Besides, you can click the Expand arrow icon and select your date from the drop-down calendar. If you have a table of dates, use the Select range icon to select a cell with the first date, or simply click the field and pick a date in your worksheet. Count it for Today's date. This option will calculate the most current age from the date of birth. In other words, it will show how young the person is by comparing their birthday to the present day. Calculate age on a Specific date. 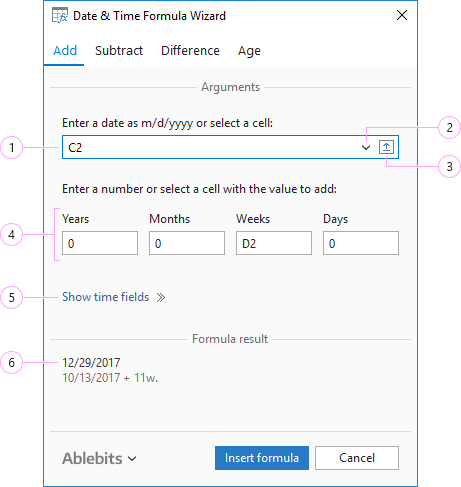 This option lets you get Excel formula to calculate age between two dates: the date of birth and any date you specify in the field. You can enter the second date in your system format, find it in the calendar using the Expand arrow icon, or pick one in your Excel worksheet using the Select range icon. Choose the way to display the result. You can convert a person's age to days, weeks, months, years, or get an exact number in years + months + days. Select the option that suits you best in the Age drop-down list. Include date unit information for the numbers you get by checking Add text labels. Or unselect this checkbox to get plain numbers. Exclude zero values from the result with the help of Do not show zero units. 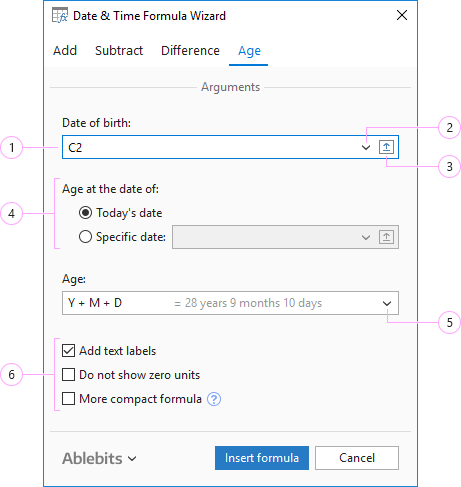 Click the Insert formula button to get a formula that calculates exact age from the date of birth in Excel. I think in this blog post you will find the formulas you need. If not, try to look for the needed information here. In column d I want to show a date they will need to transition to the next stage. If they are 3 before 8/31 of the current year they will transition on 8/31 of the current year, and if they do not turn 3 until after the 8/31 date it will be 8/31 of the next year that they will move on. Anyone have a formula to populate the cell with 8/31/current year if 3 before date or 8/31/current year plus one if not 3 before date? Difference is not returning Zero weeks if Date 1:Today < Date2 12/31/2019. It is returning 40 weeks. Thank you for the comment. That is right, the difference between Today and 12/31/2019 is 40 weeks. 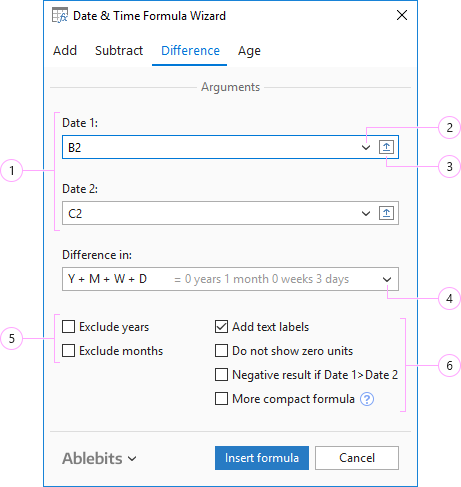 In the Difference option, the tool does not subtract one date from another but calculates the period of time between the two dates, that is why it is called the difference. Did I manage to dispel your doubts? Can you choose a null date in date picker? Thank you for the comment. Date Picker uses the standard Excel's dates variety, where the "null" date is 1/1/1900. Or maybe you meant something else? If so, please describe your task in more detail, including the definition of "null date" as you see it.